When it comes to .223 Rem semi-automatic rifle, the Ruger Mini 14 has been a popular choice for a long time, over 40 years to be exact. Now that you own one of these little gems, you may be wondering, what is the best mini 14 scope? Well, I have done the research and come up with a list of my top picks for you to choose from. My favorite scope for the Mini 14 is the Nikon P-223 3-9×40 BDC. If a beginner shooter walks into a shop and chooses a rifle, he will have a lot of questions, have done a generous amount of research, and decide how he wants to use his rifle. As he talks to the store clerk and decides on a great rifle, plunking down a grand, he decides to throw in a cheap scope. What this beginner hunter doesn’t understand is that a good scope is just as important as a good rifle, if not more important. Think about it. You can hit a target with a mediocre rifle and a great scope, but if you have a top of the line rifle and a lousy scope, you will miss a lot. Wasting all that expensive ammunition. There is a difference between rifle scopes and gun sights. Both devices help shooters aim and hit a target. Some sights are simple while others use lenses that are similar to scope lenses. The biggest difference between sight and scopes is the magnification. There are a few different types of sights. Open sights are where you line up a rear and a front sight on a rifle. This is a basic sight that most pistols and rifles have. Aperture sights are just like open sights except the rear sight is a ring and you line up the front sight in the middle of the ring. Red dot sights project a red dot on top of the image of the target. The red dot does not project out the end of the sight. Laser sights project laser beams toward the target. If you are looking for a scope that is 3-9×40, like our top pick, the Nikon P-223 3-9×40 BDC, it’s best to know what the numbers mean.The first two numbers mean how much magnification power the scope has. 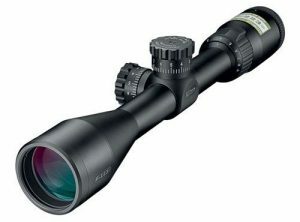 This scope has a range of 3-9x magnification. This means the image you see through the scope is at least 3 times larger than how it appears to the naked eye. Having two numbers (3-9) means that this scope is variable. Variable means you can change the magnification settings. If 3x the magnification isn’t enough, you can increase the power all the way to 9x bigger than what the naked eye sees. Some scopes are fixed. This means that you can not increase or decrease the magnification power. 40 refers to the size of the objective lens, which is 40mm on this scope. The size of the lens tells you how much light it will let in. Larger lenses let in more light, but they also add on more weight and expense. 40mm is usually sufficient for most hunters. The type of scope you need depends on what you will be hunting. Hunting big game at around 100 yards or less does not require a high powered rifle scope. The longer the distance from your target, the higher powered scope you will need. Also you will need to consider where you will be hunting. Dense forest hunting will not need as high powered magnification as an open field. If you hunt for food or sport, you need to have patience, skill, and be focused. You also need to be safety conscious. It’s a good idea to take a hunter’s safety course. Most states, if not all, require a safety course before getting your hunting license. The IRA and the IHA (International Hunters Association) have courses for hunters safety. Treat every gun as if it is loaded. Never point the gun at yourself or another person. Practice muzzle safety by keeping it pointed in a safe direction, like the ground. Be sure of your target. You want to make sure there is nothing between you and your target. You want to make sure your target is not a human. You want to have a humane kill, so make the first shot count. Wear hunter orange. You may not be the only hunter out. You want to be visible and you want others to not mistake you for an animal. Don’t hunt alone. You should hunt with at least one partner. If there are any accidents or issues you want someone to be able to help you or get help, if necessary. If you are in a tree stand, be aware of your surrounding. Tree stands are not the biggest areas and they are high up. If you fall out you can be hurt so practice safety measures while in a tree stand. Let’s get to our top picks for scopes for a Mini 14. 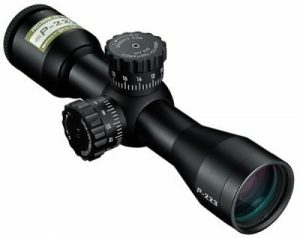 This scope is just as good as the other P-223, but gives you an option if you like a fixed magnification power. The entire P line is multi coated for extreme brightness and is optimized for use with Nikon Spot On Ballistic Match Technology. This scope will help you master every tactical scenario. It zeros at 100 yards with aiming points out to 500 yards. Fully multi coated optics for brightness and a fast focus eyepiece deliver maximum reliability and accuracy. A 3-9×40 is a great all around hunting scope that you will probably use for the rest of your hunting life. It works for a coyote that’s 70 yards away from you, to a white tail that’s 130 yards away from you, the 3-9×40 will be what you need. 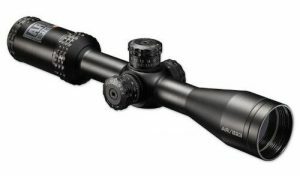 With such a big variety of scopes to choose from, budget may be the determining factor for you. This is one reason why I really liked the Nikon P-223 3-9×40. 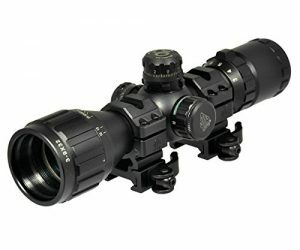 It is a high quality scope with some nice features that won’t break the bank. If you like this review, visit our Gun Scopes resource page for more gun scopes reviews.